Yes, I went to the farmer's market on Saturday. I spent a lot of time agonizing over WHICH farmer's market to go to, actually, before deciding on Parkmerced. Instead of telling you what I bought, I'll just show you close up photos of Saturday's farmer's market selections (facebook.com, no login required). Yes, it's very easy to post photos to Facebook. Yes, I have very little control over the page layout and appearance, and someday, when I leave FB, I'll lose these pages. But for now, I am enjoying the laziness it allows me. -Beckmann's Big California sourdough and strawberry-ollalieberry pie. This is a bakery out of Santa Cruz, and when I buy pre-sliced bread, it is usually theirs. I hadn't even realized that they made pastries until we spotted the pie table. Yes, a table of pies. Yes, that is a lovely thing. -Blackberries. Three baskets for four dollars. I'm not kidding! -Pluots. These are my favorite fruit this week. -Tomatoes. I was impressed at the selection of heirloom varieties across the stands. 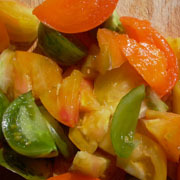 We eventually chose our tomatoes for completely artistic/aesthetic purposes, but got the haul of gorgeous yellowness for just $1 a pound, and you can't beat that, so it was wise overall. -Enormous, organic, purple onions with fresh, crisp greens. -Globe eggplant: smooth, tender, shiny, purple goodness. -We also bought prepared foods from East and West Gourmet Afghan Food: lentil curry, cilantro pesto, and spinach bolani. If you'd have parathas, you have had bolani: they are just like tortillas stuffed with a thin layer of filling. They are soft and moist, and lovely topped with a cilantro sauce. The lentil "curry" is tasty but very mild. I wanted basil, but there was none to be had. I'll live, I suppose. 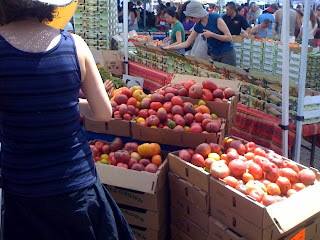 I went to the Heart of The City Farmer's Market at Civic Center today, which was awash in cherries and peaches. Those amazing little eggplant that are shaped like eggs and look as if they've been dipped in green and white paint are appearing, along with many purple ones. I am waiting, obsessively, for tomato season, but am not yet impressed. 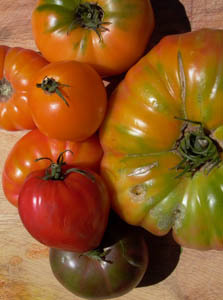 Most of the roma-style tomatoes looked abused. I picked up some cherry tomatoes, but am becoming impatient. -lettuce (to wear on my head)(I'm just checking to see if you're reading my parenthetical statements, which often have little relevance and just run on and on and on, like a work of philosophy, but even less coherent). After some debate over whether or not it was worth riding in a car, we visited the Alemany Farmer's Market Saturday after a long hiatus. I expected it to be sparse, with many empty booths, but it was packed - some of the vendors that usually set up in the center parking area managed to secure space under the roof. Our primary mission was to acquire satsuma mandarin oranges, which we have been hopelessly addicted to since I picked up a small case of them at TJ's. These are the mandarin oranges of the sort they can: completely sweet and seedless, with the loosest of rinds that can be peeled off with the least effort. 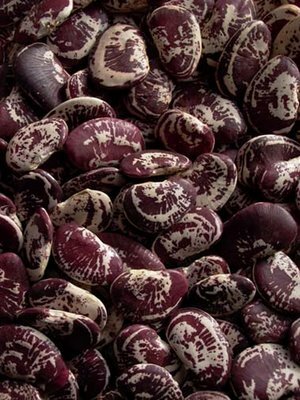 It is difficult to choose them - the skin is so loose, you can't judge much about the fruit inside - but they are addictive. 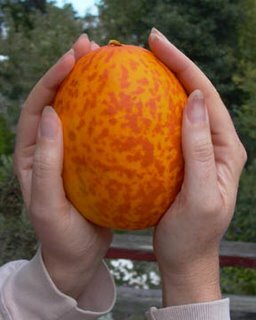 Also, there are many types labeled satsumas that are similar, but have tighter skin and seeds, so we were very careful in choosing. Satsuma mandarin oranges may be the only fruit that Steven can eat faster than I can. We acquired a large bag of them, but I know it won't last. We also acquired... Just about everything else on this list, actually. It all looked so good, and smelled so fresh. The other special acquisition was pomegranate juice - real, fresh, undiluted pomegranate juice that actually tastes EXACTLY like pomegranates. I bought a small bottle, and loved it zealously: it will be all I can do not to buy the $20 gallon next week. This stuff is addictive, and so much better than the grape-sweetened bottles you find in stores. I'm looking forward to next Saturday already! Saturday I went for a walk at Parkmerced, which is a retro-cool, rather strange apartment development near Lake Merced in San Francisco. It's probably the closest thing SF has to a "planned residential community," and it has always struck me as rather foreign. There are a few high rise apartment towers with a radial structure (the wings all meet in a center core), surrounded by wide lawns and low-rise stucco dwellings with wholly alien architectural details. They are in the process of repainting the complex, and I went to shoot photos in both color and black and white of some of the buildings. 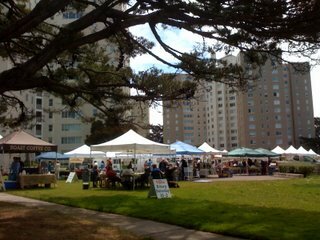 While I was there, I happened upon the Parkmerced Farmer's Market (localharvest.org), a small, well-stocked open air market which localharvest.org says runs "Saturdays, 10 am - 2 pm, June - October." I can't resist a farmer's market - when can you ever have enough fresh fruit and veggies? So I let go of my camera and bought some produce. The market had about a dozen stands. In contrast to the huge overflowing boxes and piles of produce at Alemany, or the abundance of woven baskets at Ferry Plaza, Parkmerced's market was about tidy, rather artful arrangements of fruits and veggies on tablecloths (also known as nice tarps). There were cut flowers, broccoli, cauliflower, tomatoes, peaches, plums, nectarines, heirloom tomatoes, baby bok choy and several other Asian veggies, sweet and hot peppers, lettuces, leeks, potatoes, melons, long eggplant, and those lovely green and white eggplant that look like they are painted... Every booth sold several items, the way you'd like to imagine small, well-run, diversified farms do, and so there was a good selection. Since I was there on a photography mission and didn't have a big canvas bag, I went easy. I got heirloom tomatoes (just $2.50 a pound) of five different varieties, including an apricot-colored tomato that is nearly solid and seedless (see inset photo for a range of the colors); fresh lettuce; leeks (since a friend recently gave me a butternut squash, I figure I'll dice the squash and bake it with leeks and garlic in parchment on a cool night); peaches (ENORMOUS, late season peaches, with good texture but very mild flavor); and pale green pluots. Then, I resumed taking photos, which was slightly trickier with my hands full of produce bags, but I did okay. The market is just a short walk from the M streetcar, the 29 Sunset, the 28, and the 17 Parkmerced - in fact, the 17 stops just across the street from the market - so close, you could hit the bus with a peach, if you tried, but that would be a waste of a good peach. Considering the size of these peaches, you might also pull a muscle throwing one. I may never have written about one of the many farmer's markets we have in San Francisco: the one at our Ferry Building, at the foot of Market Street. It's a grand market, and features a stunning number of vendors. 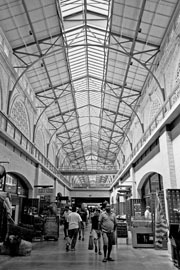 Our Ferry Building, which has been a massive transportation hub when the bay was server primarily by ferry boats, had lost its importance over the years. It still served ferries, but only a on a few routes; much of the inside had been subdivided into small, unpleasant spaces, and was used for offices. But a few years ago, the building was extensively renovated, opening up the large skylights, and making the building a very pleasant public space once again. Inside is the Ferry Building Marketplace (ferrybuildingmarketplace.com), which is an expensive gourmet food mall, with a range of restaurants, bakeries, gelato shops, delicatessens, wine shops, and other specialty food shops. It's a fabulous place to people-watch! 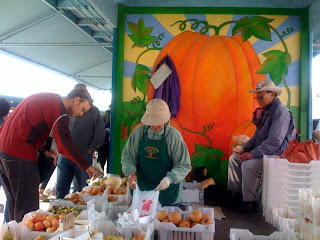 Outside, on Saturdays and Thursdays (check their website for the schedule) is the farmer's market, which unlike most other farmer's markets in SF, emphasizes locally grown ORGANIC foods. And what organic foods! The displays are mouthwatering... There is all of that amazing California produce, of course, but also cheese, breads, pastries, sauces, herbs (bundles of dried lavender were scenting the air on Saturday), animal products of various sources, olive oils... It's remarkable. The market has very high quality goods, and you will pay accordingly! One of the funnier things in comparing this market to the one on Alemany is the presentation. At the Ferry Building, everything is in a woven basket; when the bounty is excessive, it is arranged in remarkably tidy boxes, in single layers, cushioned on those fruit-pads you see in stores (the egg crates of fruit). The farmers are constantly ARRANGING the food for presentation purposes, often putting the last few potatoes or bundles of kale into smaller baskets they happen to have handy, so the produce isn't dwarfed by its (stylish) container. At Alemany, produce is presented in vast volumes in cardboard boxes, and when a box runs low, another box is usually dumped into the first while you watch. There are exceptions in each market, of course, but what is amusing is that both systems work well. I don't usually visit the Ferry Plaza market because it is in the extreme northeast corner of the City, while I live close to the southern border of town. Other markets are much closer to me. However, I really wanted to escape the fog bank enveloping my neighborhood, and enjoyed my field trip into the sunshine. -a couple of enormous avocados. There was much more I could have bought, but I have been so tired after work that I didn't want to risk buying fresh produce that I wouldn't be able to use promptly. I may have bought just enough stone fruit that Steven may actually have a chance to eat some!! My officemate was telling me about how her parents always used to wake her up early on Saturday mornings, when she wanted to sleep in and then watch cartoons, to drag her along to the chaotic farmer's market on Alemany. Since she wasn't involved in the selections, and spent her time dodging the lumbering, fast-moving shoppers towering over her, she remembered dreading the event. But now that she's an adult, she appreciates being able to get such gorgeous produce in wider selections than what is carried in stores. -pastry from one of the bakery booths. I had a mango-berry folded pastry with a bit of icing on it. It was rich enough that I couldn't eat it all in one sitting. Steven had an enormous cinnamon roll, which would have lasted me three days. -crinkly, long green sweet peppers. These have thin walls, but are very crunchy. I'll use them in stir fries and perhaps a soup. -sour melon. I've never had this before, but it's a lovely looking fruit: it's oblong, orange, and has a lovely pattern on it... I suppose I should just photograph it. I'll do that (look up at the top of this entry). I couldn't figure out what it was, and asked the farmer if it was sweet, and the farmer said it was sour like a lemon. I love lemons, and it's LOVELY, so here it is. I'll report on the flavor later. -CLING PEACHES. These are amazing. I have been craving them for weeks, and now they are available! 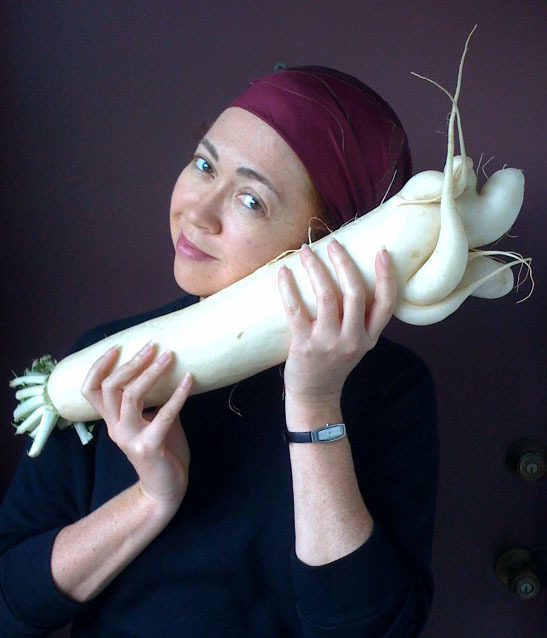 They're enormous, firm, delicious, and very juicy. -two kinds of pluots - what I think might be the "dapple dandy" spotted variety, and yellow. Wikipedia's entry for pluots says that they are 3/4 plum and 1/4 apricot, but they're really a lot more like plums. They are delicious. -blackberries!! These really are in season, because even the vines overgrowing the edge of a small green space on the side of the freeway are ripening. Farmer's Market! We biked to the Mission today for a tree tour given by a botanist: though we enjoyed chatting with other cyclists also waiting for the tour, the book author who was supposed to guide us didn't arrive. We visited a few favorite trees that Steven needed to photograph for class, visited an art supply store to acquire paper for the anthotypes Steven is making, and went to the Heart of the City Farmer's Market at Civic Center. This Wednesday and Sunday market is a bit smaller than the Alemany version, but still has an excellent selection AND is much easier to get to: it's upstairs from both BART and the underground streetcar stations, many city buses serve the area, it's centrally located, and it's easy to bike to. There are many more locally grown veggies available since the last time I visited. Kohlrabis were piled up, along with enormous purple cabbages, tender lettuces, stalks of fennel, loquats still on the stalk, zucchini (in different shapes and colors), green beans, enormous and sweet strawberries, cherries, early apricots and peaches were surrounded by the usual array of leeks, Chinese greens, and oranges. -fresh garlic! Yes! One of my favorite things this time of year. It's juicy, has drying green stalks on top, is easy to peel (with tender, wet skin; when it's young enough, you don't need to peel it), and smells oh-so-good. -a 3-pack of enormous, sweet strawberries ($6, firm and juicy, not yet at the peak of the season, but darned good!). I loved watching the farmer scrutinize the berries that the couple ahead of me purchased, and choose two or three more from his supply behind him to top off their 3-pack before allowing them to purchase it. -fava beans. We rushed home and blanched these with two kinds of pasta, and tossed them with sauteed garlic, olive oil, shredded basil leaves, and freshly ground pepper. I'm betting this will all be consumed by Tuesday night, though I may try to save some of the garlic for use later in the week.